The company, which is the 100% owner of the Kildare Zinc Project, today emerged from a trading halt announcing it has secured a key cornerstone investor that brings not only cash, but some impressive in-house knowledge and expertise to assist in taking the project to development. In a strong sign of confidence, a share placement to Dundee Resources Limited, a subsidiary of Canadian-based and Toronto Stock Exchange listed Dundee Corporation (TSX:DC.A), saw ZMI raise A$2.425 million at $0.005 per share — a 25% premium to the market price. The introduction of Dundee as a cornerstone investor with a 19.9% shareholding, has significantly strengthened ZMI’s share registry. With the share placement complete, ZMI’s top two holders, in addition to board and related parties, now hold around 45% of ZMI’s shares. The fact that the stock is so tightly held is sure sign of confidence in ZMI, especially so now with the expertise of Dundee’s team in its corner. The investment from Dundee, for which it paid a significant premium to the market price, to hold almost 20% of all stock on issue, makes you wonder what’s driving that confidence. Dundee are no amateurs. One of their assets is precious metals miner, Dundee Precious Metals, which has multiple projects spanning Canada and Eastern Europe, and is exploring in Africa. Now with plenty of cash to accelerate its zinc exploration programs, along with the chance to leverage Dundee’s expertise, ZMI is on track with a clear path to development at the Kildare Project. The appointment of 35-year veteran Adrian Goldstone as a non-executive director will also strengthen the company’s position and bring direct experience of permitting and project management in the European Union to ZMI’s Kildare project. The appointment of Goldstone illustrates just how serious ZMI is about this project and comes at an ideal time due to a current and forecast global zinc supply-demand imbalance, that’s led to an optimistic long term zinc price outlook. Ireland is the world’s richest zinc real estate in tonnes of zinc per square kilometre, and is the home of several large, high grade zinc mines including Navan, Lisheen, Galmoy and Tynagh. 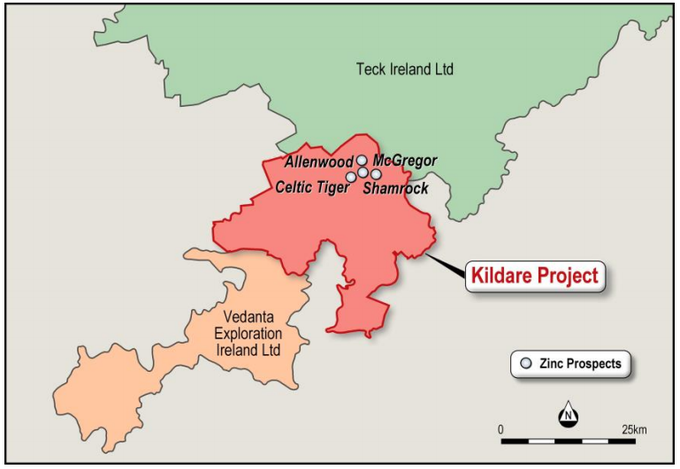 ZMI is seeking to establish a significant zinc project at Kildare by leveraging the regional exploration upside including similarities to other renowned Irish-Type zinc projects becoming visible, and Ireland having a mining friendly jurisdiction with stable government as well as excellent infrastructure and skilled labour. It will be helped in its cause by recent diamond drilling results from the Project’s McGregor Prospect, which have returned outstanding thick, high-grade zinc intercept including a true thickness of 20m at 17.64% combined zinc and lead from 390.44m depth and 23m at 13.5% zinc and lead from 396m. From here extensional drilling is underway focused on McGregor and the Shamrock prospect. The continuity and the impressive grades of the McGregor deposit continue to be reinforced by ZMI’s own drilling. This provides us with great confidence as we continue with the extensional component of the drilling campaign into the new year. Metallurgical test work will be undertaken using the samples from this latest hole. And with the focus at Kildare shifting towards development scenarios, this is an important step. If ZMI do succeed in establishing a significant zinc project in Ireland there’s considerable upside potential on offer for shareholders. With shares closing at just $0.004 prior to entering the trading halt, for a $7.8 million market cap, ZMI has plenty of room to move. A world leading zinc location, Ireland is the number one zinc mining destination in terms of zinc discovered per square metre, and Zinc of Ireland’s (ASX: ZMI) Kildare Zinc Project is right in the thick of it. Located just 40 kilometres south-west of the capital of Dublin, the Kildare Zinc Project comprises six contiguous licenses spanning 250km2 in the heart of the Rathdowney Trend. Kildare sits next to the projects of some major players. These include Canada's largest diversified resources company, Teck Resources, and India’s largest mining and non-ferrous metals company, Vedanta Resources. The Kildare Project is part of a significant mineralised system, with high-grade zinc now confirmed at four centres within a one kilometre radius. 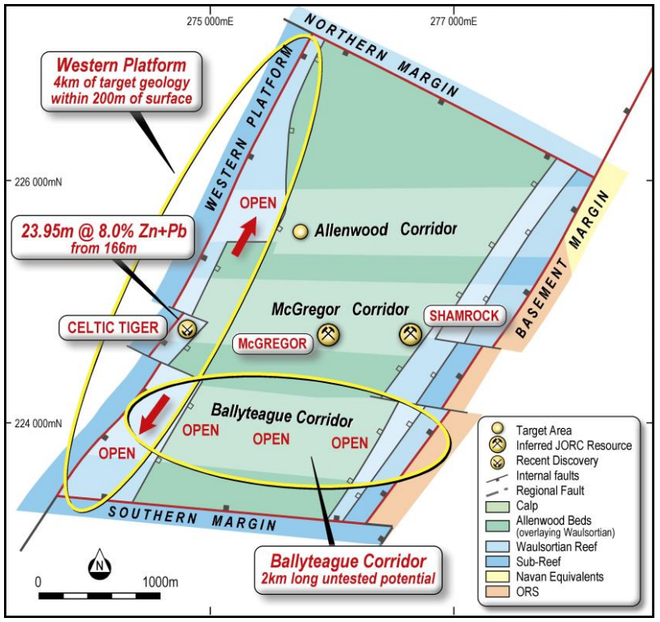 High grade intersections have been returned in the Allenwood Corridor and at Celtic Tiger in the current phase of drilling. Irish Type Zinc deposits typically occur in clusters, as can be observed at Vedanta’s Lisheen Mine and as exploration efforts continue at the project, hallmarks of Irish Type Zinc deposits are being observed. 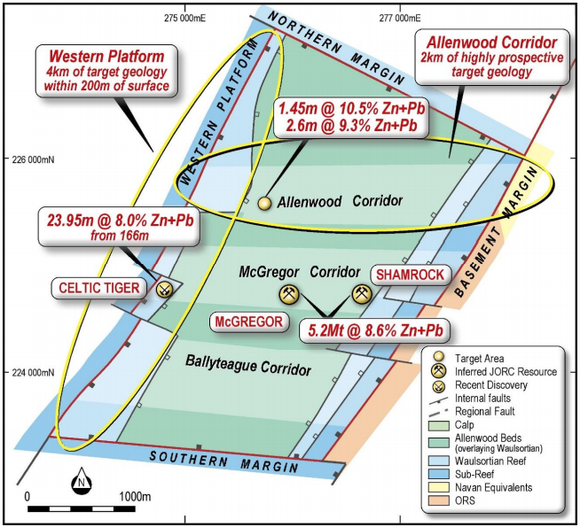 With ZMI’s existing resource zones of McGregor and Shamrock, and the recent discovery of Celtic Tiger to the west, the McGregor Corridor is showing signs very similar to Lisheen where the high-grade mineralisation is strung along E-W controlling structures. Zinc Metal Distribution Heatmaps at Lisheen (top), and along the McGregor Corridor, both at the same scale. Note the comparable ‘cluster’ nature of mineralisation typical of Base of Reef hosted Irish Type deposits. The current drilling program is exploring the region in the immediate vicinity of the McGregor Resource, and the area between McGregor and Shamrock, before following up at Allenwood and Celtic Tiger. 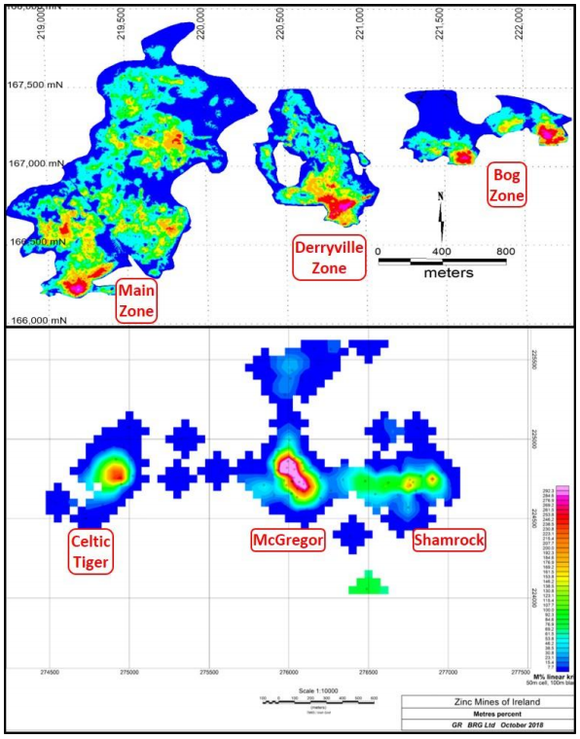 The McGregor and Shamrock Resource Zones have a Resource of 5.2Mt at 8.6% zinc and lead. Celtic Tiger has high-grade, shallow zinc, including 23.95m at 8.0% zinc and lead from 166m, and is mineralisation over strike of 160m. The Allenwood Corridor displays newly discovered high-grade zinc, including 2.6m at 9.3% zinc and lead from 171.9m. It has a genuine two kilometres long exploration target. 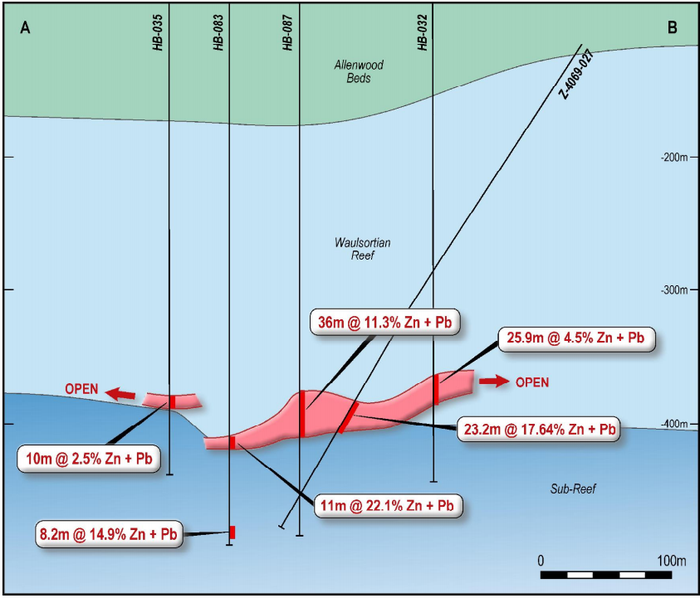 The Western Platform has four kilometres of potential for shallow zinc-lead mineralisation. Phase 4 of a drilling program is currently underway at Kildare. The most recent results, which arrived in November, highlighted the intersection of exceptional thick, high-grade mineralisation at the project’s McGregor Prospect. Hole 027 (Z_4069_027) is the first hole in the immediate vicinity of the McGregor Resource in the drilling program and was designed to test an area of the McGregor deposit not previously drilled by ZMI. 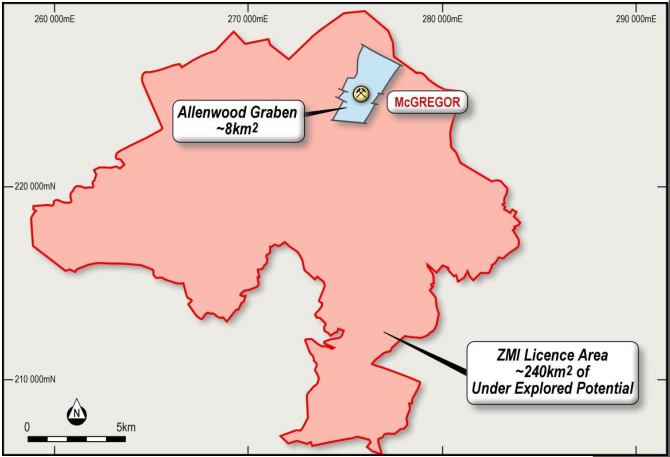 The existing Resource at the McGregor Prospect measures 4Mt at 8.8% zinc and lead. It has considerable scope for growth with outstanding development potential. It has high grade zones measuring greater than 15% zinc and lead, thick zones of greater than 20m, and consistent >200m% zinc and lead, and is flat-lying. We can now confidently report that drilling hole 027 met all these objectives. Diamond drilling returned an intercept comprising 23.2m at 14.71% zinc and 2.93% lead from 458.4m. This equates to a calculated true thickness of 20m a 17.64% combined zinc and lead from 390.44m depth. 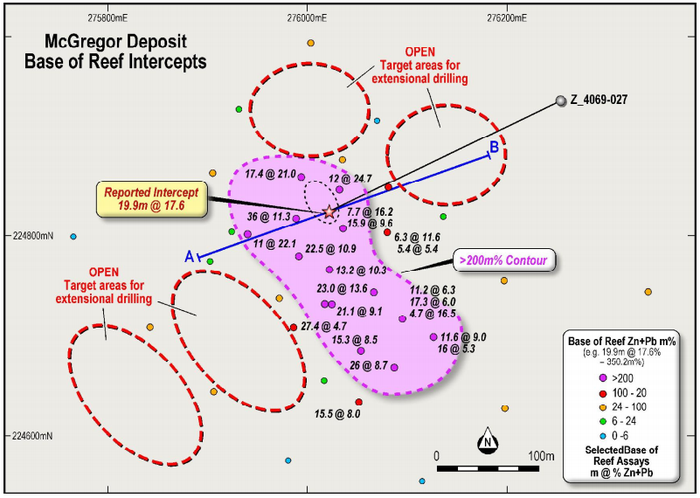 The intercept in hole 027 is located within the northern portion of the McGregor deposit and was drilled principally to obtain a representative mineralised sample for confirmatory metallurgical test work and to confirm the thickness and tenor of mineralisation intersected in adjacent historical drill holes. This confirmation of thick high-grade mineralisation that’s adjacent to similarly well-mineralised historical holes adds confidence to the historical data set. Along with previous exploration, this hole confirms the potential on offer at the Kildare project for multiple high-grade bodies of Irish-type zinc and lead mineralisation akin to nearby deposits such as Lisheen and Galmoy. These samples will be now used to undertake metallurgical test work with results from the metallurgical testing due in February. These results will be used for resource appraisals and development scenario assessment. Spectacular colliform textures in massive sulphide mineralisation from 027. Tan is sphalerite, greenish is marcasite, and dark grey is galena. Note the abundant galena crystals in the bottom right photograph. Hole 027 is the first hole drilled in the immediate vicinity of the McGregor Resource as part of the ongoing Phase 4 drilling program. ZMI will take this, along with other metallurgical data from planned test work to assess various development scenarios. Extensional drilling is ongoing and will continue into 2019. While ZMI described the result from hole 27 as ‘exceptional’, the regional potential at Kildare of shallow and deeper prospectivity was largely ignored. As the exploration focus has been on and around McGregor, the regional potential at less than 200m deep remains overlooked, while the potential at more greater than 300m remains wide open. Adding to its existing cash at hand, the share placement to Dundee will position ZMI with around A$4.7 million cash — a position from which it’s well placed to accelerate its exploration and development programs at the Kildare Project and regionally. This strong capital position will also allow for ongoing studies in relation to ZMI’s resources, while other technical and development studies will be accelerated too. As stated, the appointment of Adrian Goldstone as a non-executive director will be crucial to the project’s acceleration. Goldstone’s 35 years in the industry has seen him specialise in best practice project management. Goldstone has been involved in, or overseen, turning minerals exploration projects into development projects all over the world. Most recently he was the executive responsible for Dundee Precious Metals major projects in Europe and Africa and had oversight of large capital project management, sustainable business development, environment and CSR management, permitting and compliance, key relationship management at central and local government, and operational health and safety. Goldstone has been highly successful in the areas of environmental, social licence and project management and taking new projects, particularly Dundee’s African and European projects, through the development process and into construction. Along with Dundee’s investment, which represents a strong endorsement of the Kildare zinc project and the ZMI team, the company will gain the in-house knowledge and expertise that the Dundee Goodman Merchant Partners (DGMP). DGMP is a division of Goodman & Company, which finances and provides M&A advice to mining companies through all phases of development. It has a respected corporate finance team with deep technical backgrounds in engineering and geology and a strong history of development and mining in Europe. Another reason for optimism is the addition of Sean Hasson as Exploration Manager. Hasson, who brings significant experience to ZMI, will manage ZMI’s drilling campaign and other technical activities. Hasson was Vice President Exploration of Dundee Precious Metals from 2005-2010 after joining Dundee in 2003 as Exploration Manager. From 2010 to 2014, he was Executive Vice President of Exploration at Avala Resources Ltd and was Executive Vice President of Exploration and Director of Dunav Resources Ltd, both of which were eventually acquired by Dundee Precious Metals in 2016. Since his roles at Dundee, Avala and Dunav, Hasson has been involved in a range of exploration, development and mining projects, with a focus in Europe. With Hasson and Dundee’s expertise, along with historical data and the exceptional intersections from recent drilling, ZMI is certainly well places to work towards transitioning to become a developer. The immediate emphasis now turns to adding high grade tonnes while gaining a better understanding the potential economics of the project. The recent addition of Dr Julian Barnes to ZMI’s Board of Directors. Barnes is a geologist with extensive experience in major exploration and development projects. Previously, he was Executive Vice President Dundee Precious Metals, founded and led Resource Service Group which ultimately became RSG Global and was then sold to Coffey Mining. While more will become clear shortly with a scoping study to be undertaken this year, the wider market fundamentals are supportive. The demand fundamentals remain strong for zinc, the world’s fourth most consumed metal after iron, aluminium, and copper. Supply limitations combined with global demand forecast to grow by 2% annually, largely driven by Chinese growth, should support zinc prices going forward. In fact, a forecast 287,000t additional of metal production is required to meet demand each year. Although prices have pulled back since peaking just above US$3500/tonne in early 2018, zinc’s fundamentals remain in place and aren’t expected to change anytime soon. The metal’s recent price weakness reflects a disconnect between market expectations and supply and demand fundamentals. Osisko Metals’ Jeff Hussey expects zinc prices to roar higher in 2019 as the base metal embarks on a long-term bull market once there is more clarity on global trade and growth. Simply, it comes down to there not being enough supply to match growing demand. This is especially true for galvanized steel, which is where half of all zinc demand comes from. The zinc coating is used to prevent steel from rusting. The lack of supply has much to do with limited current exploration. The supply-demand divide is such that if all expected development projects were to come on line at full capacity, by mid-2020 demand would still outstrip supply. These fundamentals suggest there is limited risks of further downside in the zinc price long term. The location of Kildare in this proven zinc region of Ireland is enough in itself to consider the potential upside on offer. Yet Dundee’s interest adds extra weight to the idea that ZMI could be sitting on something substantial. And with its investment, along with its in-house expertise, plus the addition of Sean Hasson, ZMI has all the pieces in place to progress to development. Of course that is if exploration results continue to come on supportive of further investigation. On that note, more will be known shortly with results from metallurgical testing are due in February. And if they’re anything like the recent drill results that demonstrated exceptional thick, high grade zinc then we have reason to be confident. With the stock sitting at 0.4 cents per share, for a $7.8 million market cap, ZMI shares are still trading at a discount to what Dundee paid. Yet if all goes to plan we can’t see the aspiring developer at these levels for long.